Apple iTunes makes sharing data between your iPhone and your computer a breeze. Contacts stored in your iPhone’s address book can easily be copied to your computer. However, it would be difficult if you want to print contact list from iPhone directly. But don’t get disappointed, here we’d like to share you 4 solutions to perform the task. One way to print contacts from iPhone 5s/6/6s/SE/7/8/X is using iTunes Backup Extractor in combination with iTunes backup. If you have an available iTunes backup, this tool can extract contacts from iPhone backup and lets you print them within three simple steps. Launch iTunes Backup Extractor and choose the backup file matched for your iPhone, then click “Next”. Select “Contacts” from the listed file types, then hit “Next” to scan the backup to find all your contacts. Preview and check contacts in the result page, then click “Recover” to export them as HTML file. Open the contacts.html file and check all contacts, then click on “Print”. Note: Besides html, this iPhone Backup Extractor also supports to export contacts from iPhone as other readable formats like CSV and vCard for better viewing. It is able to find both existing and deleted contacts on iPhone, as well as other data like messages, photos, videos and so on. 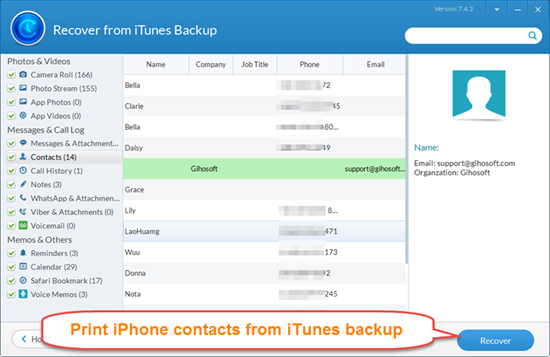 Besides iTunes backup, iCloud also enables its users to directly print contacts from iPhone or iPad. All you just need is to toggle on “Contacts” in the iPhone Settings > Apple ID > iCloud, and then follow these steps below. Make sure you’ve activated the iCloud contacts syncing features. Open iCloud.com on your computer, and log in with your Apple ID. Click into Contacts icon, and check all your contacts to see if there’s any missing. Click on the Gear icon, first hit Select All; then again click Gear icon and choose “Print”. After adjust the printing settings, you can now print out all your contacts from iPhone. 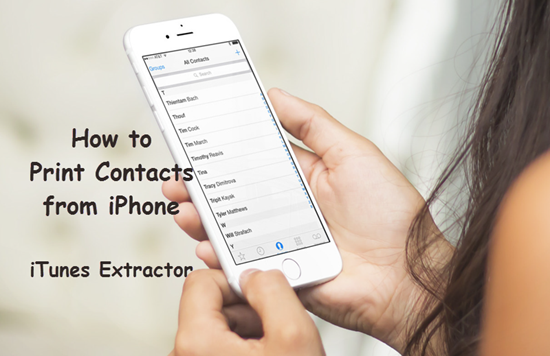 If you want to directly print all contacts from iPhone, there’s always a way for you. As a powerful data recovery software, Gihosoft iPhone Data Recovery is embedded with printing function for iPhone contacts, and all you need is to follow these simple steps. 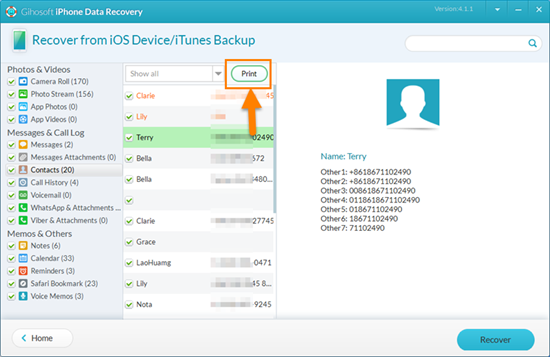 Step 1: Run Gihosoft iPhone Data Recovery, and select “Contacts”. Step 2: Connect iPhone to computer and click Next to scan. Step 3: After scanning, check your contacts and select them. Step 4: Click “Print” button next to the filer bar, and then adjust the settings to print them out. Make sure you’ve turned off iCloud contact syncing in iPhone Settings > iCloud > Contacts. Connect your iPhone to the computer. Launch iTunes and click the “iPhone” icon on the left side of the screen. Click the “Info” tab and place a check mark beside “Sync Contacts with”. Select “Windows Contacts” under the drop-down menu and hit “Apply”. Minimize iTunes, click “Start” and then click your username. Locate the “Contacts” folder and click into it. (Windows 7) On the menu bar, select “Export”. Choose “CSV” and then click “Export”. Choose where to save the file and click “Next” to continue. Select the iPhone contacts filed you wish to keep and hit “Finish”. Now that you have your iPhone contacts in CSV file. Open it as a spreadsheet and print your contacts. If you’ve associated Gmail or Outlook to your computer, you can also choose “Sync Contacts with Outlook/Google” in the third step, and then export contacts from the service website as CSV for printing.